There’s more action, more excitement, and more spectacular effects in this thrilling new chapter of the epic Maze Runner saga that’s taken the world by storm! They may have escaped from the Maze, but Thomas (Dylan O’Brien) and his fellow Gladers now face a greater challenge: searching for clues about the secret organisation known as WCKD. Their journey leads them to the Scorch, a desolate wasteland filled with unimaginable dangers. 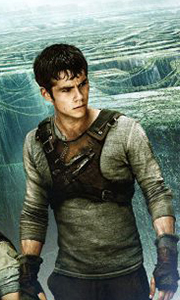 The ..
Thomas (Dylan O'Brien) leads his group of escaped Gladers on their final mission. To save their friends, they must break into the legendary Last City, a WCKD-controlled labyrinth that may turn out to be the deadliest maze of all! Anyone who makes it out alive will get answers to the questions the Gladers have been asking since they first arrived in the maze. Special Features Deleted & Extended Scenes With Optional Audio Commentary By W..
Own The Maze Runner - The Death Cure DVD from Deff, DVD, Blu-Ray & 4K Video Specialists - Free UK Delivery..
Own The Maze Runner / The Maze Runner - Scorch Trials DVD from Deff, DVD, Blu-Ray & 4K Video Specialists - Free UK Delivery.. In this heart-pounding thriller based on the best-selling novel, Thomas (Dylan O'Brien of MTV's Teen Wolf) wakes up trapped in a massive, ever-changing maze with a group of boys who have no memory of the outside world. Facing dangerous obstacles at every turn - especially the deadly Grievers that roam the concrete corridors at night - Thomas and the others must race to piece together clues in the order to discover their true purpose... ..
Own The Maze Runner - The Death Cure 4K Ultra HD from Deff, DVD, Blu-Ray & 4K Video Specialists - Free UK Delivery..
Own The Maze Runner 1 - 3 DVD from Deff, DVD, Blu-Ray & 4K Video Specialists - Free UK Delivery..